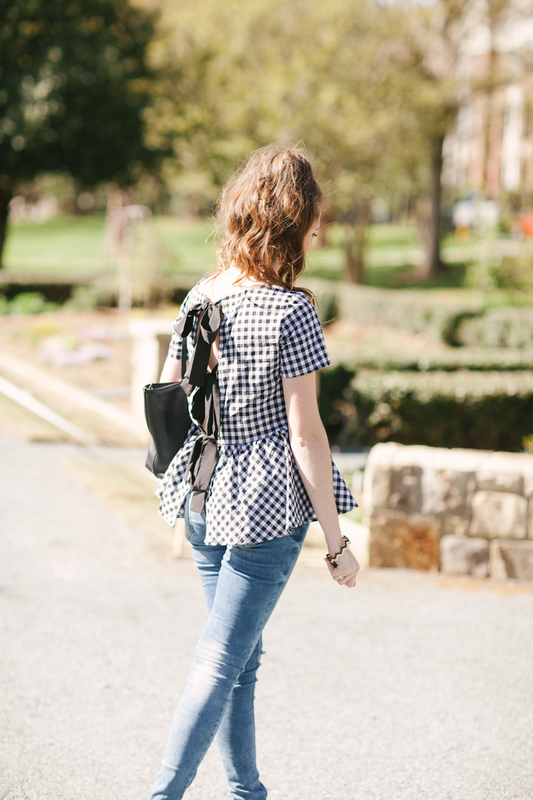 Spring Gingham Look + Vermont Moving Update. 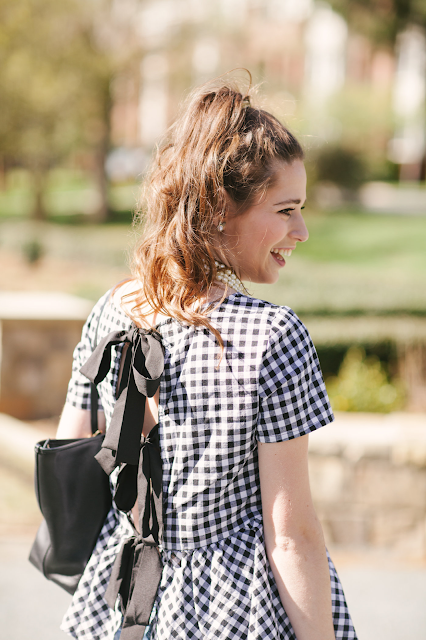 The gingham trend has been in full force for awhile now, and I'll admit that it's taken me a little while to fully enjoy it. 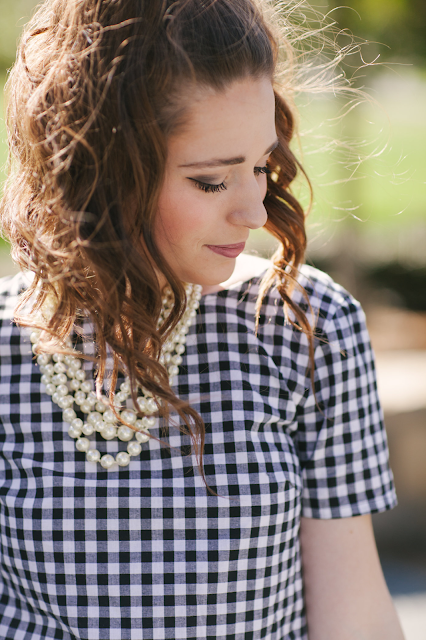 But the top that I'm wearing in today's blog post has fully converted me into a gingham fan! This very easily might end up being one of my favorite tops for this spring and summer! 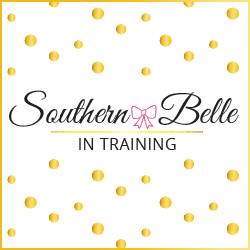 Peplum and bows are two of my favorite details to look for in tops, and of course this one has both of those! I mean- can you get over the adorable bows on the back up the top? 😉 The higher neckline on it makes it easy to dress up with necklaces, and I chose to pair it for this outfit with one of my favorite necklaces of all time (which definitely makes its way around the blog quite often! ), my layered pearl strand necklace. I think this top is an amazing steal for its price point for $20, and I know that it will be on repeat in my wardrobe for the next few months. If you've been following me on social media or read Wednesday's latest Midweek Ramblings posts then you know that I have arrived in Vermont to begin my first job in radio broadcasting! When I was in college, I would always move home to Maine for the summer (my dad would fly down to help me pack up and drive home), and those moves never went well. Studying for finals and end of the year activities always took priority for me over moving, so I always did a terrible job at packing. I was determined to do a better job with my Vermont move this time around, as I talked a little bit about in Wednesday's post. I definitely think that I did a better job with packing and preparing for the move and would give myself a gold star for that, however the moving in part of the move has not been going so smoothly since arriving in Vermont. Both of my parents are here to help me unpack and settle in which I have been so grateful for, but still some things with moving in general have been tough to deal with and things have been moving a lot more slowly than I anticipated. I was hoping to be 100% settled before starting my job next week, but that's not looking likely now. Anyways- I'm not really sure where I was going with all of that, but I guess I just wanted to remind y'all that real life 100% happens to bloggers too! I will definitely try and write some moving blog posts at some point about things I'm glad I did to prepare for the move and think I did well, and also about the things that didn't go as well upon arriving here in Vermont. This top is so cute! I'm glad that the move has been going well! The bows on the back of that top are adorable. Don't be too hard on yourself for not being fully settled yet...I moved two weeks ago and I'm not completely unpacked yet. All the boxes are killing me but I'm so busy with work that I can't let it overwhelm me. I can't wait to hear about your new job! Congrats on the new job! That's so exciting! Ok- I'm kind of totally swooning over this top!! OBSESSED! I'm in love with this outfit, especially the back of that top! OMG your top is so darling! Love the bows on the back! The bows are too cute! Congrats on the move and the job! I love the top! And your hair looks awesome! Oh, I love this!! This is such a beautiful top!! 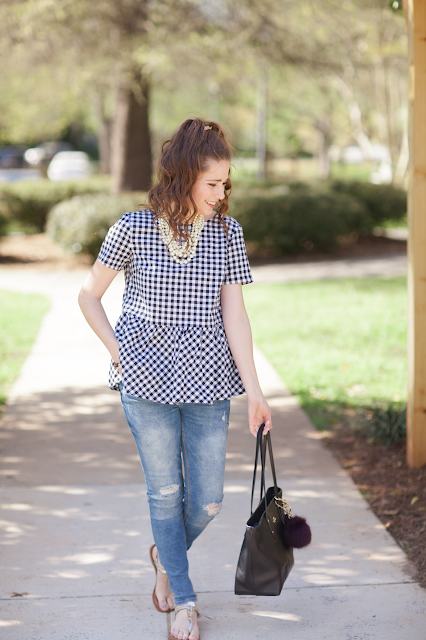 Not sure if I'm ready to get into peplum yet but it looks amazing on you! OMG you're going to be working in radio broadcasting?! That sounds like such a fun job! I've always listened to the radio personalities and wished I could like intern for them or something! Have fun at the new job! That is such a cute top - definitely love the bows! Sorry your move hasn't gone all that well, but you'll be all settled before you know it - it just might take a little longer than your thought! 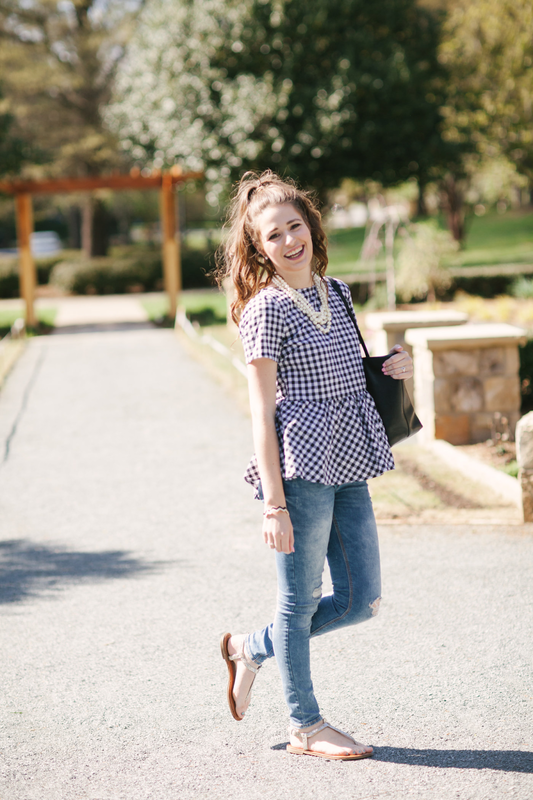 That gingham top is way to cute babe! love this whole look. I love this top! I almost bought it the other day, the bows are too cute. So glad you made it back up to Vermont! So pretty! And jealous, I have always wanted to see Vermont! I bet you are so excited about your move and I cannot wait to see more posts about it! Vermont seems so awesome! This outfit is so cute on you, Annaliese- love the gingham! Can't wait to see your new Vermont apartment! Perpetually logical and an outstanding contribution to the world of bloggers. Spring Sweater for Date Night. Rome Outfit: Floral Midi Skirt. 5 Ways To Keep Your Stress Down Before Moving. A Dream Fulfilled: Beginning My Radio Career. HUGE Graduation Dress Round Up! Going Away Festivities at Le Meridien Charlotte!